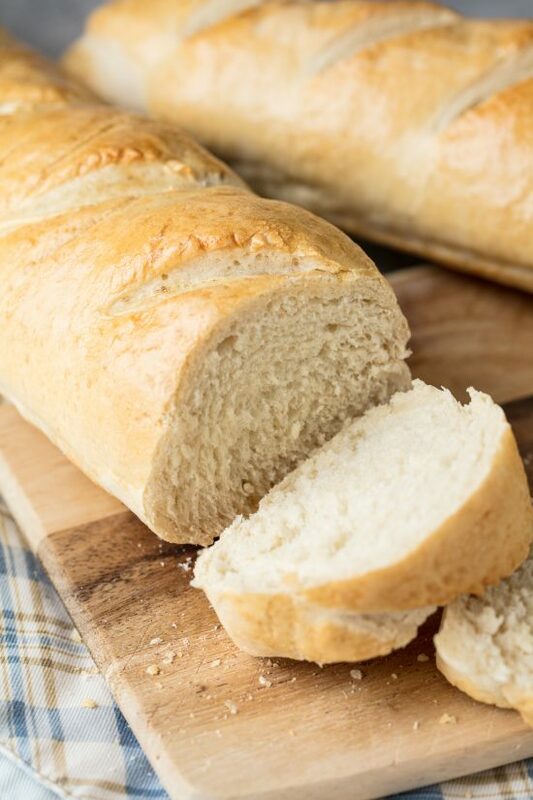 Learn how to make Perfect Homemade French Bread. It only requires a handful of ingredients to make perfect bakery style bread at home! There’s nothing quite like homemade bread. 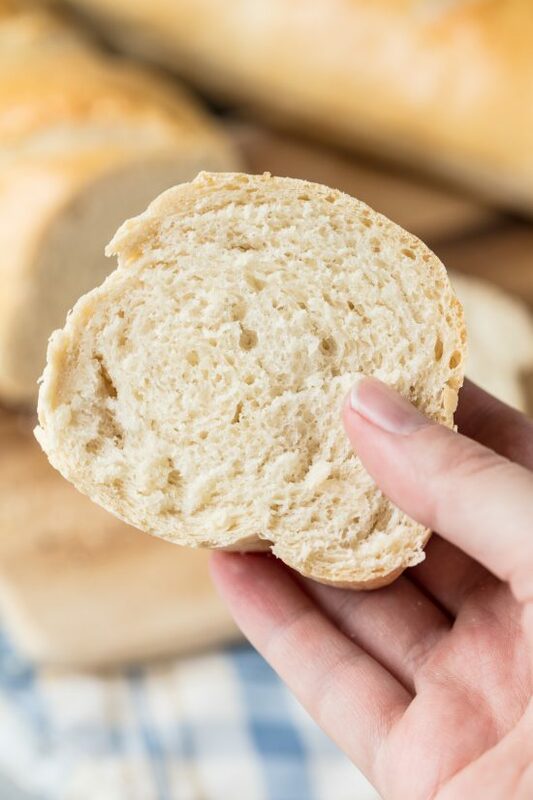 This homemade French bread is perfectly soft, with a nice chewy crust. It’s also incredible simple and easy to make at home using just a handful of ingredients that most bakers will already have on hand. It really doesn’t take much time either. Yes, it’s nearly 3 hours from start to finish, but your actual hands on time is quite minimal. A few minutes here, a few minutes there, and you have deliciously perfect homemade french bread at home. If you come to love homemade french bread, I highly recommend investing in a french bread pan. It is perforated (has a lot of holes) which allows for even heat circulation. This ensures the best, highest quality of loaf at home. I highly recommend purchasing one. They are cheap and make a world of difference in the end result. If you don’t have a French bread pan, you can always use a regular baking sheet. Just be sure to give your loaves enough space in between them so that they don’t end up connected. 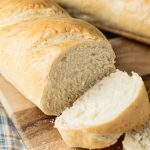 If you enjoy making homemade bread, be sure to check out my other homemade bread recipes. You may be interested in my famous Homemade Dinner Rolls or maybe you are more interested in other loaf recipes like my Rosemary Focaccia or my Homemade Rye Bread. If you are feeling more adventurous, be sure to check out my Cinnamon Roll Twist Bread and my Jalapeno Cheese Bread. Making your own perfect loaf of French bread is all about technique. I’ve created a video to give you a visual reference beyond the written recipe. Watch the video below where I walk you through every step of the recipe so that you can get the perfect loaf at home as well. In the bowl of a stand mixer, add yeast, water, salt, and 5 cups of flour. Knead on a slow speed until the flour has started to combine. Increase speed to medium and gradually add in remaining flour until dough pulls away from the sides of the bowl. Transfer to a lightly greased mixing bowl, cover with a towel, and let rise until double in size, about 1 hour. Divide dough in half. Roll each half into a large rectangle. Roll up tightly from the long end. Place onto a lightly greased baking sheet or into a french bread pan. Cover and let rise 30-45 minutes. Preheat oven to 375 degrees. Use a sharp knife to cut diagonal slashes on the top of each bread loaf, about 1/4 inch deep. Brush loaves with beaten egg. Bake in preheated oven for 35-40 minutes, until golden brown. I love the challenge of baking bread. Seems it comes out different every time. lol I would leave out the egg (many recipes do) and add sugar to taste. My significant other likes the bread a little sweet. But, that may disqualify it from being “French”. Who knows? What if you don’t have a stand mixer? You can always make the dough by hand by stirring and kneading. Nothing wrong with the old fashioned way! If I only have self-rising flour would that work? No. Never use self rising flour in a recipe unless it specifically calls for it. 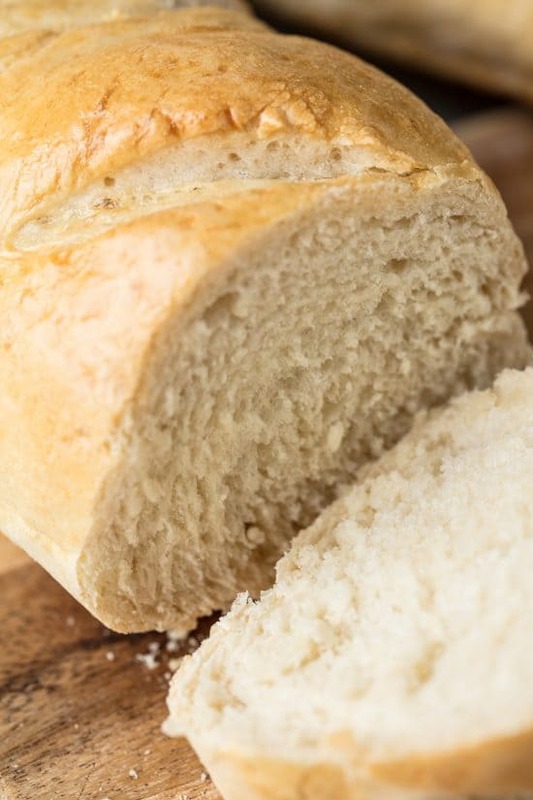 You can use either bread flour or plain flour. Can you freeze the dough if you don’t need two loaves? I have the pyrex glass tubes can i use them for baking this bread? Can I use White Whole Wheat Flour or Pastry Flour? How would either of these flours affect the making, baking & tasting of the loaf? Because they have different protein contents, they will impact the texture of the bread. What can you used instead of egg? Can’t use eggs due to allergies. Thank you! You can just skip the egg. Your loaf won’t be shiny, but it will still taste great. This is by far the best french bread I have ever made. The loaves rose perfectly and came out looking beautiful! Thanks!